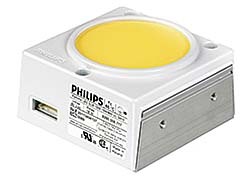 Fortimo LED downlight module is equipped with a remote phosphor technology to enhance LED efficacy, according to the company. Lamp has a minimum CRI of 80 and a color consistency of 3 standard deviation of color matching (SDCM). Color temperature options include 2700K, 3000K, 3500K and 4000K. Dimming options include 0-10 V, trailing edge (TE) and DALI. Lifetime of 70 percent lumen maintenance at 50,000 hours.